As we all know the main festival among hindus, but with the time span the proper way to celebrate this holy festival is diminishing. Half of us do not know the proper way to celebrate Diwali, though there is no proper way to worship all mighty lord, but still there are certain rituals which we can follow and can teach our generations to come. What we all desire from diwali, no matter in our home or work, is monetary gains. There are certain ways we can hitch this gains up, with acceleration like never before. 1) Clean your house and surrounding. Dump off any sort of old or unused items. They cause a big hindrance in the monetary gains. 2) Meet & Greet people with happiness. Give away gifts and receive them with happiness. 4) Worship Lord Ganesha for knowledge and Luck and worship Goddess Lakshmi for Money and Prosperity. 5) The 8 directions of the home should be lit with lights; none of them should be in dark. 6) On the main entrance of your home, lit 6 diya in the shape of â€œchaumukhiâ€. 1) Place idols of Lakshmi Jee and Lord Ganesha over a red cloth. 2) The Idols should be new in every Deepawali; if it is of silver then you should clean them nicely before poojan. 3) Place some coins (preferably silver) over green or dark blue cloth. 4) The Temple should be setup in the NorthEast or North direction. You can always have a temporary temple in this direction for Deepawali poojan. 5) The deepak which is to be lit in front of Lakshmi jee should be of pure ghee. It is advised to let it glow through out the night. 6) Other things to be included in the pooja is: mauli(red thread), gulal(red color),sava ser chawal(rice). 1) In South-West Direction of your dwelling, plant green color plants, if its not feasible then you can always have a â€œgreen color jungle paintingâ€. 9 horses painting or idol (calm in nature) can be hung in the same direction. 2) If you have a sick family member or want that the elders should remain in good health, then in the east direction of your home, keep clean water with some salt in it. 3) Coming to your kitchen, place knives or any sharp edged things in the box or cupboard, DO NOT KEEP THEM IN OPEN. They have got negative energy for you. 4) You should keep Kuber, shree yantra, Maha Yantra in the north direction of your home and worship them with red flowers,GangaJal and Lakshmi Pooja. 5) If you want that this festival season should give you a car or scooter as a fruit, then keep the painting for the same. 1) 4-5 days before Deepawali, pluck some pipal tree leaves and with the paste of Turmeric Powder(haldi) & Curd(dahi) write â€œshreeâ€ (of course the symbol). Place these in the temple at the time of Deepawali poojan. After the pooja, take one leaf and place it in your CashBox. Other leaves can be used to place in almirah etc etc. This is all you can do to make your festival more prosperous and worthy. Rest it is all your faith in god and your luck. 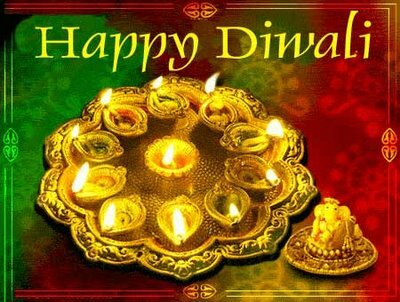 Wishing You A Very Happy Deepwali and Great Time ! !